This week, we reach back into the archives for this hidden gem from 1963. An anthology film, the vignettes are based on three Nathaniel Hawthorne tales, and all three star horror legend and perennial Slimy Wall favorite Vincent Price. Although several of Hawthorne's tales fall within the horror category, they're hardly of the spine-chilling variety we've come to expect from the genre, but more ruminations on the human condition and how our insecurities and irrational desires can, and often do, lead to disaster. Not the nightmare-producing fare one would get from, say, Hawthorne contemporary Edgar Allen Poe, but the atmospheric, psychological terror offered in these tales is an interesting variation nonetheless. The three tales offered in this film are Dr Heidigger's Experiment, Rappaccini's Daughter and The House of Seven Gables. Of the three, the last is perhaps Hawthorne's best-known story, but it is the first two that provide the most intriguing narratives. Interestingly, though, all three tales deal in one way or another with lost love, and the extremes to which people will sometimes go to either reclaim it, avenge it, or prevent ever being hurt by love again. There are many things to recommend the film, including the wonderful adaptation of the three Hawthorne stories by scripter Robert E Kent and the sumptuous costumes and sets. But probably the best thing is the chance to see Vincent Price in three different roles, displaying the range that was sometimes overlooked in Price's more traditional horror films. Of the three, I feel the second, Rappaccini's Daughter, plays best to Price's strengths, allowing him the opportunity to play world-weary, regretful and slightly malevolent all in one. Of course, the remainder of the cast are no slouches either; in fact, this is one of those rare films where, although the lead shines very brightly, the supporting players are all up to the same standard, with Sebastian Cabot being chief among them as the eponymous medical professional of the first tale. Even the heroines, so often chosen more for beauty than for brains or talent, acquit themselves well, and Beverly Garland in particular does an admirable job with what can often be a thankless part in a horror film. 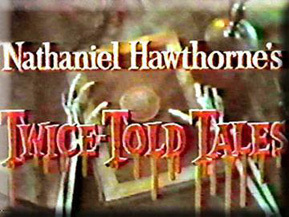 In all, while Twice-Told Tales won't scare the pants off even the most timid of viewers, it will disturb the thoughts long enough afterwards to eminently qualify it as an entry in the horror genre, and it is a highly entertaining way to acquaint oneself with one of America's literary giants of the 19th century.